The condition monitoring interface module CSI-B-2 is another element in the HYDAC condition monitoring concept. It connects the sensor level with the interpretation level. Indeed, it is an all-purpose electronic instrument. It converts the HSI signal from HYDAC SMART sensors into a standardised PC signal. Using the HYDAC “CMWIN” PC software, it is, therefore, possible to read the data and measured values of the connected SMART sensor directly. What’s more, the connected sensor can deliver long-term memory information. It can also deliver adjustments made and parameters set on it (the setting options depend on the particular sensor). Furthermore, the conversion of the HSI signal can be either into an RS 232 or an RS 485 signal. The connection of the CSI-B-2 can be to any PC via the RS 232 interface (and possibly an additional standard RS 232/USB adapter1). 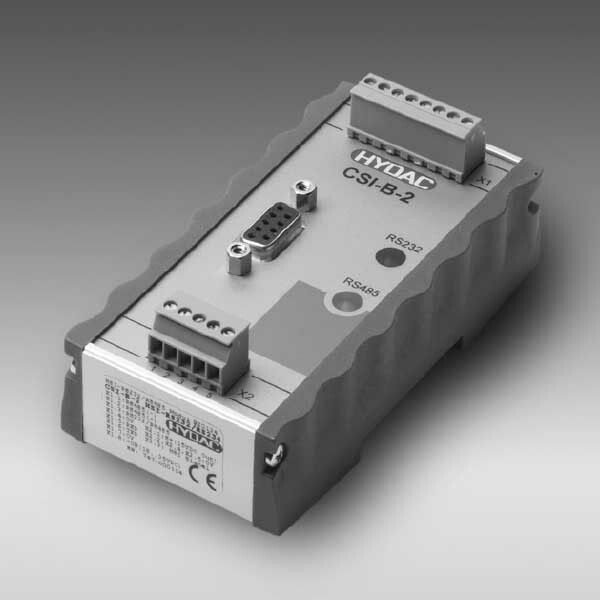 It is also possible to use the RS 485 interface and appropriate additional coupling modules to connect to higher-level control and/or bus systems.